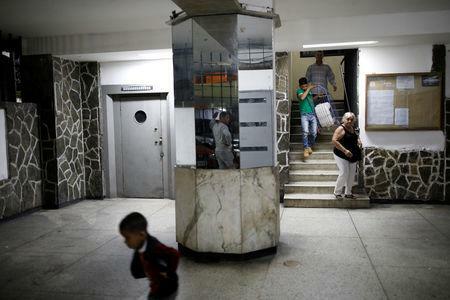 CARACAS (Reuters) - Living with a scarcity of water is becoming the norm for many Venezuelans. Families interviewed by Reuters say they have spent months without receiving any water from the tap after power blackouts cut off supply and pipes failed due to a lack of maintenance. Faced with uncertainty of when it might return, and whether it would be enough, they are conserving as much as water as they can take from rivers or buy at shops. They are bathing, washing clothes and dishes, and cooking with just a few liters a day. From the poorest slums, to the wealthiest neighborhoods, the shortage of water cuts across Venezuelan society as families endure the country's deepest ever economic crisis. A 5 liter (1.32 gallons) bottle costs about $2 at a Caracas supermarket, out of reach for many low-income people in Venezuela, where the monthly minimum wage is only around $6 each month. "We try to save water scrubbing ourselves standing in bowls," said Yudith Contreras, a 49-year-old lawyer, in her apartment where little water has arrived over the past two years. She has taken to getting water from streams that run down the Avila mountain above Caracas. 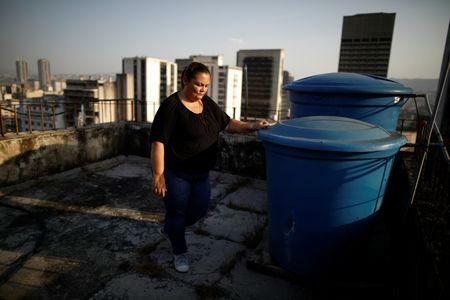 Contreras, who is from one of the families interviewed by Reuters in a ten-story housing complex in downtown Caracas, said her family recycles the water by using it to flush the toilet. In her kitchen and bathroom, she keeps containers of water, which she carries up the nine floors to her apartment as the elevator does not work. "You have to save water because we don't know how long this situation will go on for," she said. Some residents of the building, a few blocks from the presidential Miraflores Palace, have already exhausted their water supplies. "Today I finished all that I had stored," said David Riveros, a retired bus driver living on the first floor. President Nicolas Maduro's government blames the scarcity of water on a long drought and also accuses opponents of sabotaging its supply. The country's opposition, led by Juan Guaido, who in January invoked the constitution to assume the interim presidency after declaring Maduro's re-election a fraud, says the problem is due to little maintenance done over many years on Venezuela's power and water networks. Earlier this month, Venezuela was plunged deeper into chaos after a near week-long power blackout cut off the already scant water supply to most residents. Since then, Maduro has promised to place enormous water tanks on the roofs of houses and apartment blocks to alleviate the problem. Since the nationwide blackout, the worst in decades, lines of people queuing to fill up water flowing from the Avila have multiplied, despite warnings that the water was not fit for consumption and could contain bacteria and parasites. 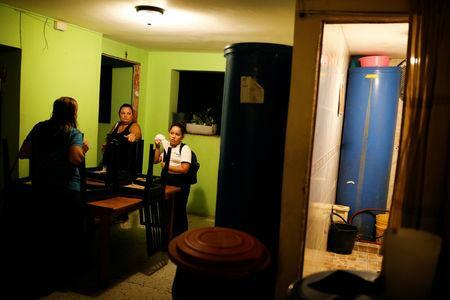 Yuneisy Flores, a 31-year-old homemaker whose family live on the fourth floor, washes her dishes in cartons and strains the water to remove the leftovers of food. She then uses the liquid to flush the toilet. She bathes her 3-year-old daughter in a sink to recycle the water. In her home, three tanks and several other containers collect water when it comes intermittently. Flores, her husband, and their two little children bathe in one of the tanks, which holds some 18 liters. "It's hard, too hard, you can die without water," she said. "We weren't aware of this before. Water now is gold."